Lets take the case of a person doing heavy exercise. Aerobic respiration is taking place, but oxygen is about to be finished up. Glycolysis occurs, Krebs cycle finishes. 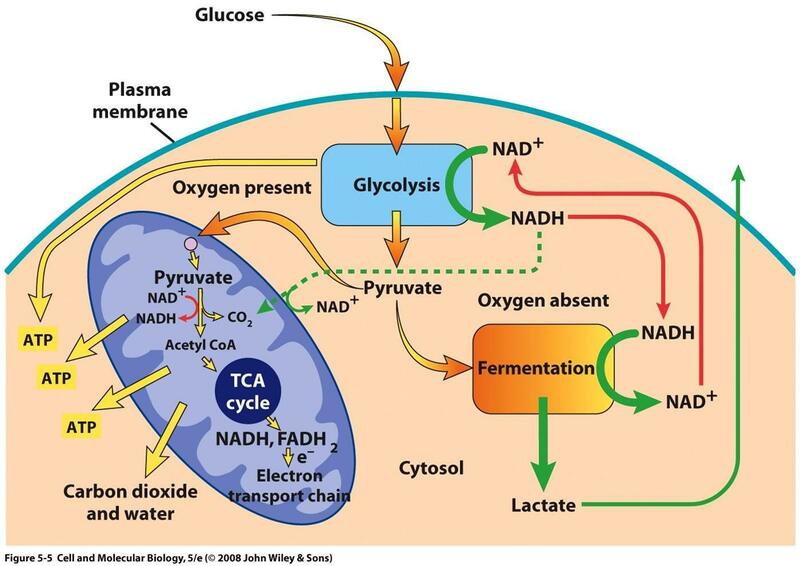 Now NADH and FADH2 enter electron transport system (ETS) to form ATP, but at the last step, cytochrome c oxidase cannot get oxygen as it just finished up. Now, what happens to the ongoing ETS? Does it go in reverse order and then arnon cycle to get back Acetyl co-A and respire anaerobically, or does this process get paused and respiration switches over to anaerobic mode till oxygen supply is replenished? The simple answer to your question is that in the absence of oxygen the electron transport chain stops. (It can't go backwards, that would generate oxygen.) However your assumption that it stops at the last step is incorrect, all the cytochromes are converted to their reduced form, and there is feedback that diverts the NADH elsewhere. The situation is complicated because it depends what tissue you are talking about and what sort of exercise and what is the fuel for respiration. However let us consider the skeletal muscle at the start of a non-sprint run. Let us assume that it will be using glycogen as a source of fuel, which is converted to pyruvate and NADH. 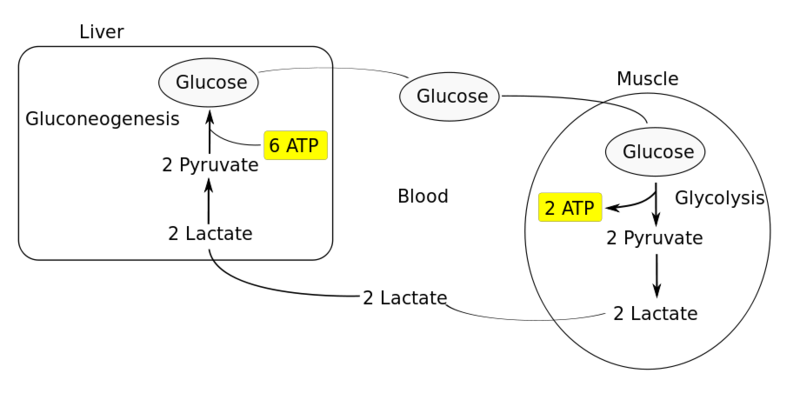 The pyruvate will enter the tricarboxylic acid (TCA) cycle in the mitochondria and be oxidized there and also produce metabolites. The NADH from glycolysis (produced by reducing NAD+) will enter the mitochondria and be oxidized; however it does not enter directly but via a shuttle, one of which — the malate-aspartate shuttle, show below — will be considered in a more detail lower down. Now let us suppose there is a sudden need to sprint so that the muscle cannot get sufficient oxygen to deal with the NADH produced in glycolysis. What happens? The key event is that pyruvate is oxidized to lactate. Why? Not because lactate is useful, but because this is an anaerobic means of oxidizing the NADH back to NAD+ to allow glycolysis to continue and ATP to be produced at the substrate level. Why doesn't the NADH keep going into the mitochondria (where it would be wasted as the electron transport chain has stopped)? 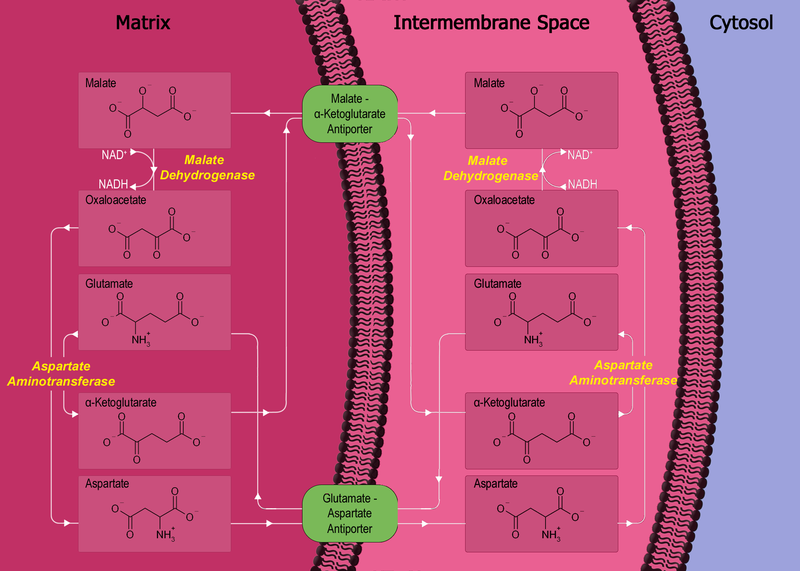 Because the shuttle stops — in the case of the malate-aspartate shuttle mitochondrial malate dehydrogenase stops converting malate to oxaloacetate, malate builds up and therefore the malate transporter stops bringing malate into the mitochondrion. 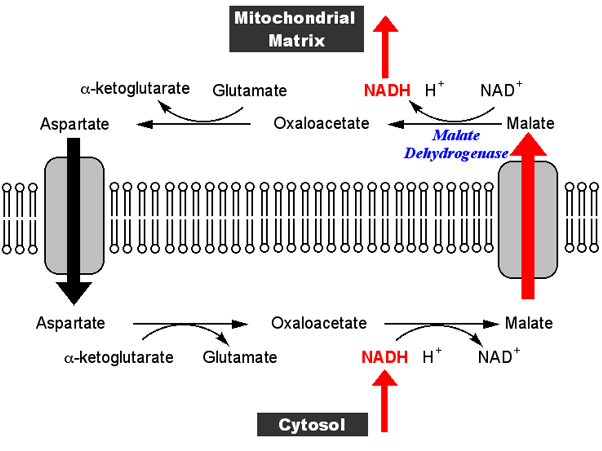 This can be understood at the most general level by the fact that if NADH in the mitochondrion cannot be oxidized it will accumulate, hence slowing and eventually arresting the malate dehydrogenase reaction by simple mass action. In fact Nature generally uses more sophisticated regulation that allows switch on and switch off to be performed more rapidly and completely, most notably by allosteric regulators. In the case of malate dehydrogenase the situation is not really clear, but there are reports that suggests citrate is an allosteric activator of the enzyme in some tissues (http://www.ncbi.nlm.nih.gov/pmc/articles/PMC1131027/). The concentration of citrate falls as the TCA cycle stops because of the lack of NAD+ (this is because TCA cycle intermediates get tapped off for other purposes) so the activating effect of this intermediate would be removed. The net result is that the NADH stays in the cytosol to be oxidized by pyruvate in the lactate dehydrogenase reaction. This can only happen if the pyruvate stays in the cytoplasm and does not move to the mitochondrion. Obviously the lack of NADH to reduce it to acetyl-CoA in the pyruvate dehydrogenase reaction would cause its concentration to build up in the mitochondrion and reduce transport across the membrane by simple mass action. 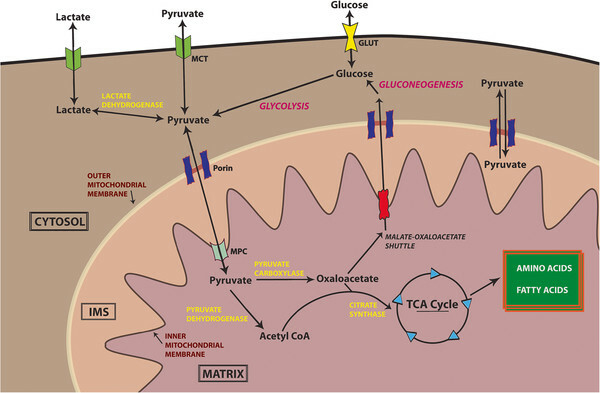 However it is likely that the specific mitochondrial pyruvate transporter is regulated by metabolites which change their concentration under these conditions. The evidence here is indirect as the transporter was only identified and cloned in 2012. Nice question. Now a perfect answer should include all the regulatory steps involved in this transition (a lot) and all the places where a change of metabolic fluxes occur. But, the question can be answered in essence at least, by a very simple model. Assume that no other regulations act except direct enzymatic feedback inhibition. This means that substrate being acted upon by an enzyme converting it to a product will stop being acted upon when the concentration of the product rises. Now, for the case in question. Lack of oxygen means that cytochrome c cannot work. Hence, it's substrate will accumulate, which is the product of the preceding enzyme, which will be blocked leading to the accumulation of its substrate and so on. This "waterlogged" system will continue leading to metabolite accumulation till pyruvate starts piling up. Now this pyruvate piling does something different because it had two enzymes that could act upon it. The other enzyme, which converts it to lactate does not have this feedback blockage and hence can function. So, the pyruvate is now converted into lactate, which requires NADH, and hence allows glycolysis to proceed (because the formation of NADH was an indispensable reaction in glycolysis), and hence, you have the anaerobic shift. Lactate doesn't pile as it has a favourable muscle-blood gradient and is quickly transported out the cell, and also because it has to pile up significantly before the enzyme forming it is back-logged. Now, to add the other regulations. What all other regulatory factors do, is to enhance this waterlogged feedback. Instead of the product piling up to a huge amount before the enzyme is inhibited, these regulations will allow a smaller pile-up to produce the feedback inhibition. So in essence, you can view the shift as a simple consequence of blocking the enzymatic chain at a particular level. I think both @David and @SatwikPasani have given nice answers, but none of them seems complete and involving all details. So I am posting another answer which involves much of the required details for benefit of readers as well as myself. Now, accumulation of both NADH and acetyl-coA inhibit the activity of pyruvate dehydrogenase12, which leads to accumulation of pyruvic acid in the mitochondrion. This is also clear from the above diagram. Since the whole process is reversible (by bringing extracellular pH to neutral), thus a dynamic equilibrium can be attained in cells with high oxygen demand, like neurons, through which cell can maintain high ATP production even in hypoxia. 1. Giancarlo Solaini, Alessandra Baracca, Giorgio Lenaz, Gianluca Sgarbi, Hypoxia and mitochondrial oxidative metabolism, Biochimica et Biophysica Acta (BBA) - Bioenergetics, Volume 1797, Issues 6–7, June–July 2010, Pages 1171-1177, ISSN 0005-2728, http://doi.org/10.1016/j.bbabio.2010.02.011. 9. Wheaton WW, Chandel NS. Hypoxia. 2. 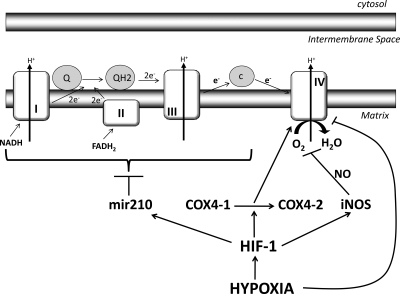 Hypoxia regulates cellular metabolism. American Journal of Physiology - Cell Physiology. 2011;300(3):C385-C393. doi:10.1152/ajpcell.00485.2010. 10. Wikipedia contributors. "Malate-aspartate shuttle." Wikipedia, The Free Encyclopedia. Wikipedia, The Free Encyclopedia, 7 Mar. 2017. Web. 7 Apr. 2017. 11. Berg JM, Tymoczko JL, Stryer L. Biochemistry. 5th edition. New York: W H Freeman; 2002. 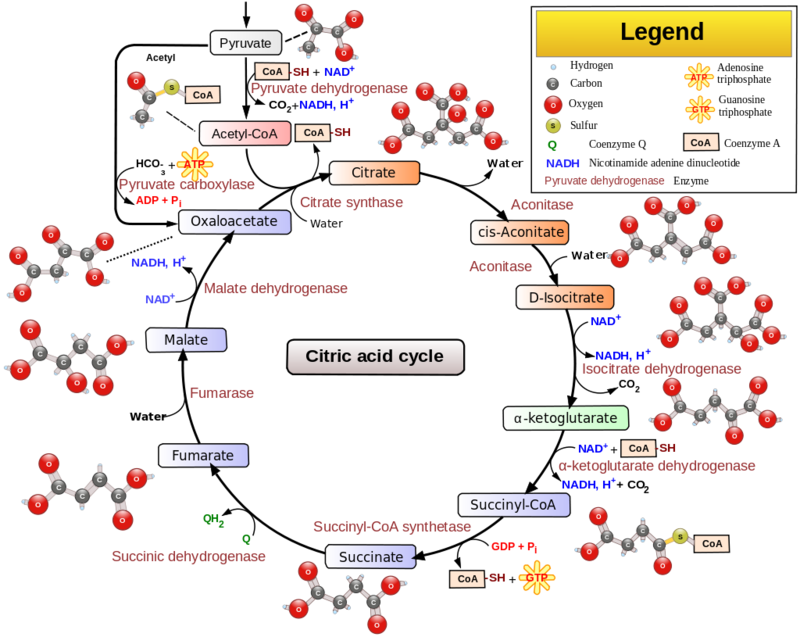 Section 17.2, Entry to the Citric Acid Cycle and Metabolism Through It Are Controlled. 12. Budde RJA, Fang TK, Randall DD, Miernyk JA. Acetyl-Coenzyme A Can Regulate Activity of the Mitochondrial Pyruvate Dehydrogenase Complex in Situ. Plant Physiology. 1991;95(1):131-136. 14. Halestrap AP, Brand MD, Denton RM. Inhibition of mitochondrial pyruvate transport by phenylpyruvate and alpha-ketoisocaproate. Biochim Biophys Acta. 1974;367:102–108. doi: 10.1016/0005-2736(74)90140-0. 15. Schell JC, Rutter J. The long and winding road to the mitochondrial pyruvate carrier. Cancer & Metabolism. 2013;1:6. doi:10.1186/2049-3002-1-6. 16. Wikipedia contributors. "Cori cycle." Wikipedia, The Free Encyclopedia. Wikipedia, The Free Encyclopedia, 28 Feb. 2017. Web. 7 Apr. 2017. 17. Smirnova, E., Griparic, L., Shurland, D. L. & van der Bliek, A. M. Dynamin-related protein Drp1 is required for mitochondrial division in mammalian cells. Mol. Biol. Cell 12, 2245–2256 (2001). 18. Tondera, D. et al. SLP-2 is required for stress-induced mitochondrial hyperfusion. EMBO J. 28, 1589–1600 (2009). 19. Frezza, C. et al. OPA1 controls apoptotic cristae remodeling independently from mitochondrial fusion. Cell 126, 177–189 (2006). Not the answer you're looking for? Browse other questions tagged biochemistry molecular-biology respiration or ask your own question. How could cyanobacteria survive the anaerobic conditions of ancient earth?